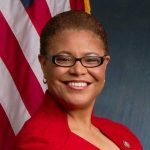 Karen Bass, MSW ’15, the first African-American woman to serve as speaker of any state legislative body, continues to open new doors in her second decade in elected office. In January, she was sworn in as chair of the Congressional Black Caucus. She serves as chair of the House Judiciary Subcommittee on Crime, Terrorism and Homeland Security and the House Foreign Affairs committee on Africa, Global Health, Global Human Rights and International Organizations. A lifelong Angeleno, Bass served as an emergency room physician assistant at Los Angeles County+USC Medical Center early in her career. She later earned a Master of Social Work degree from the USC Suzanne Dworak-Peck School of Social Work. When a wave of crack cocaine struck Los Angeles in 1990, Bass established the Community Coalition and created a new way for neighbors to confront social and economic issues at the local level. As a California State Assemblywoman, Bass’ bipartisan negotiation efforts earned her and three other California legislative leaders the 2010 John F. Kennedy Profile in Courage Award. First elected to the U.S. Congress in 2011, Bass has represented California’s 37th Congressional District, which includes the University Park Campus, since 2013. In that time, Bass has helped shape policy in child welfare, trade policy with the continent of Africa and criminal justice reform. Arthur C. Bartner, a distinguished conductor and music educator, has set a national standard for collegiate bands during nearly five decades as director of the Trojan Marching Band. Under Bartner’s direction, the band has become The Spirit of Troy, serving as musical ambassador to global audiences at Olympic Games, the Academy Awards and the Grammys. Thanks to Bartner’s leadership, the Trojan Marching Band has appeared in well over 125 movies and television shows. Its collaborations with the rock group Fleetwood Mac have resulted in two platinum albums. 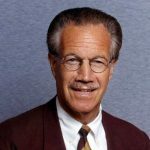 In 2006, Bartner was awarded the prestigious Lowell Mason Fellow Award by the National Association of Music Educators. He was inducted into the USC Athletic Hall of Fame in 2012. Last year, the Trojan Marching Band’s new facility was named in Bartner’s honor, and the Trojan football team established the Dr. Arthur C. Bartner Trojan Commitment Award for dedication. Mikhail Baryshnikov, a legendary artist in classical and contemporary dance, has inspired audiences around the world. He has danced over 100 roles and has performed with American Ballet Theatre, the Mariinsky Ballet, New York City Ballet, and the Royal Ballet, bringing to life some of the most iconic characters in classical ballet. An accomplished actor from stage to cinema, Baryshnikov received a Drama Desk Award, and a Tony Award nomination for Metamorphosis. His performance in The Turning Point earned an Academy Award nomination for best supporting actor. He is currently touring the play Brodsky/Baryshnikov, directed by Alvis Hermanis, and is collaborating with Jan Fabre on “Not Once,” an art installation with film. 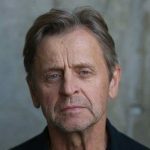 Baryshnikov’s awards include the Kennedy Center Honors, the National Medal of Honor, and Japan’s Praemium Imperiale International Arts Award. He has earned the rank of Officer of the French Legion of Honor. He is founder and artistic director of the Baryshnikov Arts Center in New York City. Edythe Broad, philanthropist, educational benefactor and patron of the arts, Edythe Broad has elevated Los Angeles’ cultural profile with generous and consistent support of the LA Opera, the Los Angeles Public Library, the Broad Stage and other arts organizations. The driving force behind the couple’s philanthropy to the opera, Broad and her husband, Eli, have donated $14 million to the LA Opera, including support for its historic production of the Ring cycle. Edythe Broad inspired her husband’s love of contemporary art, and together they founded The Broad contemporary art museum, which offers free general admission and has welcomed more than 2.5 million visitors since it opened in 2015. The Broad features one of the most prominent collections of postwar and contemporary art in the world, and appeals to a young, diverse audience. A graduate of Detroit public schools, Broad is devoted to uplifting public schools and the students they serve through initiatives such as The Broad Center, which helps develop education leaders. Broad is also a longtime supporter of the Los Angeles Public Library, where she endowed Student Zones, which offer after-school homework help to homeless and other underserved students. The Eli and Edythe Broad Center for Regenerative Medicine and Stem Cell Research at the Keck School of Medicine of USC is dedicated to early detection of disease, improved therapies and faster recovery times. 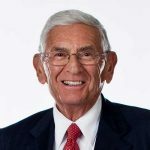 Eli Broad, an unrivaled entrepreneur and humanitarian, has expanded access to the arts, improved public schools in high-need communities and invested more than $800 million to fight life-threatening illnesses. He is the only person to have founded two Fortune 500 companies in two different industries. As a co-founder of Kaufman and Broad Homebuilding Co., today known as KB Home, he helped bring home ownership within reach for young families. His leadership of SunAmerica reinvigorated retirement savings for millions. Educated in the public school system, Broad created generous initiatives to support public school leadership and performance, especially in traditionally underserved areas. Together with his wife Edythe, Broad built a collection of contemporary art that includes 2,000 works. A selection of works from the collection are exhibited at The Broad museum in downtown Los Angeles. Over their lifetimes, the Broads have donated more than $4 billion to causes that help create a healthier and more hopeful world. Emery Brown, statistician, anesthesiologist and neuroscientist, has deepened our understanding of the human brain and expanded the boundaries of neuroscience. With infinite curiosity, Brown has used a statistical approach to create numerous breakthroughs in the field of anesthesiology. He has built new paradigms for monitoring patients under general anesthesia and has defined more accurately the brain’s response to anesthetic drugs. By deciphering the workings of anesthesia, Brown has improved the patient experience at hospitals everywhere. His statistics research has also enhanced our understanding of how the brain transmits information, and provided insight into the way neurons adapt and evolve. Brown served on President Barack Obama’s BRAIN Initiative Working Group. He has received an NIH Director’s Pioneer Award, a Guggenheim Fellowship in Applied Mathematics, the American Society of Anesthesiologists Excellence in Research Award and the Dickson Prize in Science. Brown is a fellow of the American Academy of Arts and Sciences and the National Academy of Inventors. Brown is the first African-American, the first statistician and the first anesthesiologist to be elected to the National Academy of Sciences, National Academy of Engineering and National Academy of Medicine. 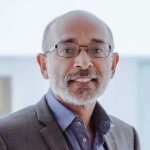 Brown is the Edward Hood Taplin Professor of Medical Engineering at the Massachusetts Institute of Technology and the Warren M. Zapol Professor of Anesthesia at Harvard Medical School and Massachusetts General Hospital. 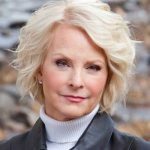 Cindy Hensley McCain ’76, MS ’78 has dedicated her life to improving the lives of those less fortunate both in the United States and around the world. As the chairman of the board of the McCain Institute for International Leadership at Arizona State University, she oversees the organization’s focus on advancing character-driven global leadership based on security, economic opportunity, freedom and human dignity. McCain also chairs the McCain Institute’s Human Trafficking Advisory Council. This is an issue she cares deeply about and is committed to ending human trafficking and supporting victims in Arizona, the United States and around the world. Through her work with the McCain Institute, several partnerships have been formed with anti-trafficking organizations working on solving various aspects of the problem. She also serves as co-chair of the Arizona Human Trafficking Council. McCain also serves on the board of directors of Project CURE and on the advisory boards of Too Small To Fail and Warriors and Quiet Waters. 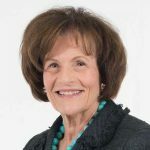 McCain holds an undergraduate degree in Education and a Master’s in Special Education from USC and is a member of the USC Rossier School of Education Board of Councilors. McCain is the chairman of her family’s business, Hensley Beverage Co., one of the largest Anheuser-Busch distributors in the nation. She is the wife of the late U.S. Sen. John McCain. Together, they have four children.